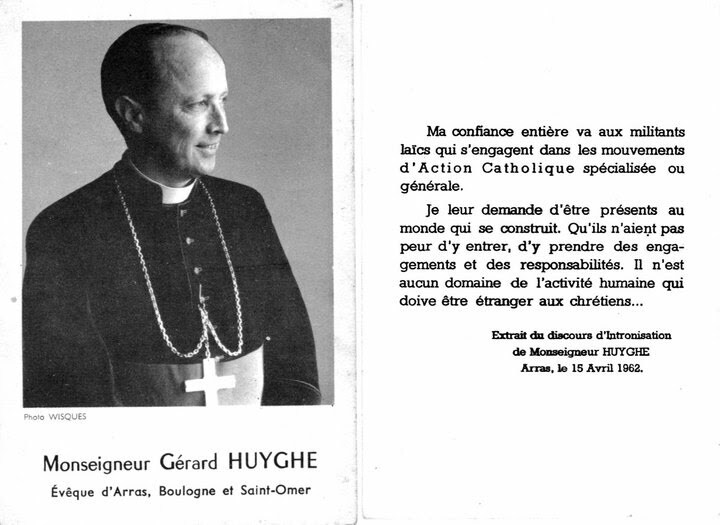 Born in 1909, Bishop Gérard Huyghe was a protégé of Cardinal Achille Liénart of Lille before becoming bishop of Arras. He was a lifelong supporter of the JOC and ACO in particular and all the specialised Catholic Action movements. Upon his ordination as a bishop in 1962 he said: "My entire confidence goes to the lay militants of the specialised or general Catholic Action movements. I ask them to be present in the world that is under construction. Let them have no fear to enter it, to take up positions and responsibilities. There is no domain of human activity that should be foreign to Christians..."
He became well known for his support for workers, particularly during a major miners' strike in 1963. Bishop Huyghe played a prominent role at Vatican II, particularly in the drafting of Perfectae Caritatis, the decree on religious life.